Now in its third cohort, UMBC’s Postdoctoral Fellows for Faculty Diversity program recognizes and supports talented scholars who are emerging as cutting-edge researchers and educators in their fields. UMBC’s newest group of fellows was formally introduced to the university community at a welcome reception held December 10, 2015. Keisha Allen, education; Mejdulene Shomali; gender and women’s studies; and Nkiru Nnawulezi, psychology, represent the 2015-17 cohort of postdoctoral fellows. The fellowship is a two-year scholar-in-residence program that supports PhDs interested in academic careers who are committed to diversity in the academy. It also prepares the scholars for possible tenure-track appointments at UMBC. “These are three talented scholars who are changing the game with their research,” shares Tyson King-Meadows, chair of Africana studies and co-chair of the Executive Committee for the Recruitment, Retention, and Advancement of Underrepresented Minority Faculty. During the fellows’ appointments, UMBC connects them with teaching and research mentors and provides professional development opportunities across the university. Keisha Allen researches how issues of race, culture, and intersectionality influence teaching and learning for historically marginalized youth. She is receiving mentorship from Mavis Sanders, professor of education, and Claudia Galindo, associate professor of language, literacy, and culture. Mejdulene Shomali’s research focuses on gender and sexuality in Arab and Arab-American literature, art, and film. Her faculty mentors are Carole McCann, professor and chair of gender and women’s studies, and Rebecca Adelman, associate professor of media and communication studies. Nkiru Nnawulezi’s research uses ecological theory to understand the factors that promote or hinder the well-being of survivors of gender-based violence. She is primarily interested in exploring how social identity and culture influence African-American women survivors’ disclosure and help-seeking practices, as well as determining ways to improve support systems and communities’ response to gender-based violence. She is being mentored by Christopher Murphy, professor and chair of psychology; Shawn Bediako, associate professor of psychology; and Nicole Else-Quest, associate professor of psychology. Welcoming and supporting diverse faculty members is a longstanding UMBC priority that has received renewed focus this year, as an important national conversation emerged on university diversity issues. Provost Philip Rous and Tyson King-Meadows recently wrote directly to the campus community about UMBC’s ongoing faculty diversity initiatives. “The story and the history of UMBC is that of a community that, through the commitment and hard work of our faculty, staff and students, has dedicated itself to creating a new model of the public research university based upon the principle of inclusive excellence,” the message stated. UMBC has established a national reputation for the diversity and academic excellence of its student body. The message from Rous and King-Meadows outlined important work that still needs to be done to better recruit and retain underrepresented minority faculty that reflect the diversity of the university’s students. “Our collective acknowledgment of this imperative is reflected in our new strategic plan which identifies diversifying our faculty as a critical step toward advancing all aspects of our mission,” the message noted. UMBC’s new strategic plan also identifies staff diversity as an important area of future growth. At the post-doctoral fellows welcome reception, King-Meadows and Scott Casper, dean of the College of Arts, Humanities, and Social Sciences, spoke about UMBC’s mission, and recognized the fellows program as one of many UMBC initiatives to support promising graduate students, future faculty members, and current faculty from underrepresented minorities. The fellows explained they are eager to move forward with developing their research and teaching over next two years, and to take advantage of the many resources UMBC has to offer. Read more about the Postdoctoral Fellows for Faculty Diversity program, including information about previous cohorts. 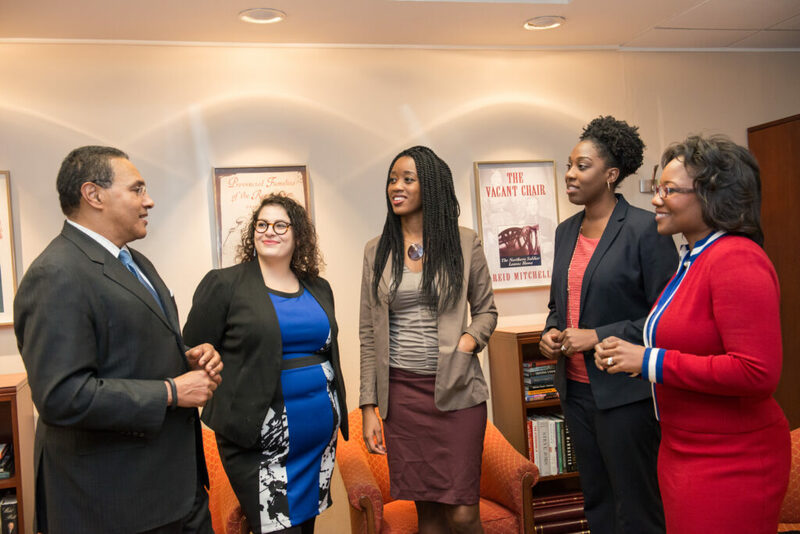 Images (photos by Marlayna Demond ’11 for UMBC): Keisha Allen, Nkiru Nnawulezi, and Mejdulene Shomali; President Hrabowski meets with the current cohort of Postdoctoral Fellows for Faculty Diversity.